Though humans have a common understanding of what the senses are, our "Common Sensing" tends us toward radically differing interpretations of the sensed world. One person's sense of humor, justice and appropriateness may vary wildly from another's. Uncommon Sense is a collection of works by companies combining elements of circus arts, dance, narrative and physical theatre to illuminate themes related to social justice. 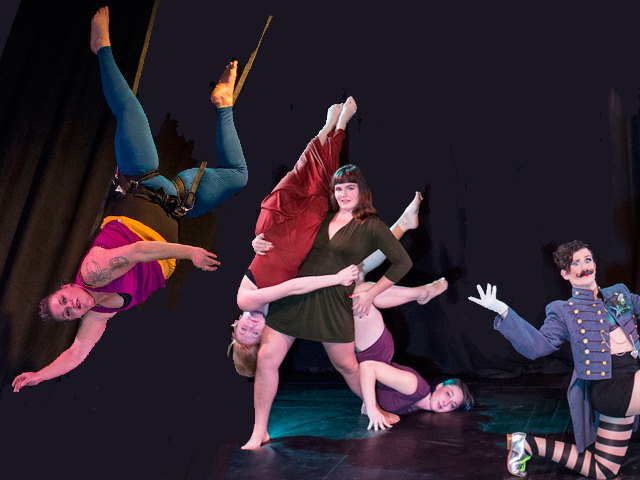 Featuring performers from diverse theatrical and physical disciplines, and accompanied by a live mixed-abilities band, Echo Theater Company's Cartwheeling Uphill explores how assumptions affect our expectations, and how limitations offer opportunities for creativity and growth to arise. Sister: Grit's Premiere Project, What We Have Been Given, is an exploration of perspective inspired by the effects of socialization and family, and how these intersect to shape our individual truths. Using acrobatics, aerial arts, and dance, Tempos will explore the trials and strengths of our most challenging critic, the one inside. Sir Cupcake's Queer Circus explores mythology, grand gestures and wicked magic with his band of queer and trans performers.